It's the birthday of Wolfgang Amadeus Mozart, born in Salzburg, Austria (1756). His whole life was devoted to music. He was a child prodigy: by the time he was five he could perform difficult pieces on both piano and violin. He made a name for himself as a composer when he was in his teens, and went on to write some of the most popular operas of all time, including The Marriage of Figaro (1786), Don Giovanni (1787), and The Magic Flute (1791). Mozart spent most of his adult life in Vienna, and made a living by teaching, publishing music, giving concerts, and composing. He was always pretty well-off for a musician — he had a carriage and servants, and lived in a nice apartment — but he spent money faster than he made it, and he often had to borrow from friends and relatives. 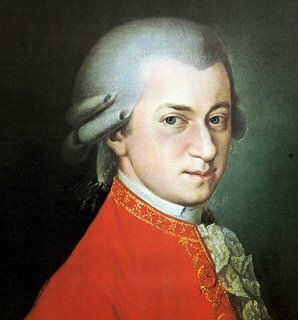 He stayed close to his father throughout his life, and when his father died, Mozart fell into a deep depression. He stopped performing in public and relied on teaching to make ends meet. He died four years later, at the age of 35, while he was in the middle of composing his last piece, Requiem in D, which he wrote as his own funeral march. He didn't actually write anything for the pipes on purpose. But if you've ever heard the lovely slow aire "Gilnockie" you may have noticed the similarity to the piano sonata #11. Not a co-incidence. Some of the melodies to his four horn concerti fit rather well on the pipes, too. They have acquired the best first baseman that ever was. Nobody saves a shortstop's bacon like Darin Erstad; I swear on a stack of bishops, he can field a rickety throw at a radius of 10 or 12 feet, all with one foot still on first base. And now he's going to the White Sox. Surely unique in the annals of conversion stories. "So, how did the day-after reporting on the Washington March go?" I hear you ask. Pretty much as expected. The PT couldn't be bothered. The Times, however, found a place down on the bottom of page 10 -- about a quarter of a page, including the picture. And what made it to page 1? Iraq, of course. The heart-warming, inspiring, and so forth, story of some football coaches. And a man who quit talking for over 15 years to protest pollution, although he did continue to play the banjo. This is Roe v Wade anniversary day. I think I would probably have missed it if Fr Fernando hadn't delivered one of his stem-winders at the noon Mass today. If there is anything in the whole anti-life circus -- abortion, fetal stem cell research, in vitro fertilization, frozen embryos, etc. -- that he failed to explain and condemn I can't imagine what it might be. When Fr Fernando gets excited about his topic he gets louder and speaks faster. Today he also lost track of the time; a half hour homily on a week day is not typical even for the Oblates. It was quite a piece of oratory. You shoulda been there. But maybe you were at the March on Washington instead. Mind you, if you depended upon the local media in Los Angeles you wouldn't know it was going on. I saw nothing on it in the Times or the PT today. Google brought up a few articles, although you had to call it "Pro life March on Washington"; just "March on Washington" gives you 40 year old demonstrations for civil rights (which is what I thought pro life was, but never mind), something on gay rights, atheists, and assorted other causes. But nothing on Nellie Gray's troops, at least in the first batch of results. Oddly enough, the first report Google listed on the Pro life march was one from VOA. I don't think I've ever before seen VOA as a primary source for a news story from Google. If you can lay your hands on the 6 January 2007 number of The Spectator (or buy your way into the on-line archive), you'll learn in Dot Wordsworth's excellent column how a great many household names became household names and why their original meanings aren't what you and I thought they were. Why, for instance, aren't there any pans in the pantry? Because pantry is from pan, panis the Latin for bread and the pantry is where you used to keep your bread. And the man who had charge of the bread in your average palatial estate was the pantler or the panter. The larder actually used to be used for lard -- of a sort. "Lard in Old French" says Mrs Wordsworth "meant bacon, hence lardoons". And butlers were orignally not so much interested in preventing Bertie Wooster from wearing stripes with checks as they were with what he drank. "A butler," we learn, "was in charge of the cellar where the buticula or bottles are kept." "Butler" and "bottle" appear to be first cousins. And there was once such a thing as a "butleress" before she became a "housekeeper". You really ought to reconnoitre a copy. Learn why there is no butter in a buttery. The blog has been sitting idle for so long I was afraid the battery would be dead. But so far things seem to be ticking along in proper order. Let's just let it warm up for a while, maybe let the alternator give it a charge, before we take it out on the information superhighway and see how it fares against the Issues of the Day. While, we're waiting, I might explain that the only thing standing between me and The Inn was guilt. No catastrophes, cataclysms, or calamities. Just guilt. I had a talk to give yesterday and I couldn't attempt to add anything to The Inn without being smitten with the you-really-ought-to-be-working-on-the-talk compulsion. I don't know why that should be, really. I'm always supposed to be doing something else. Like practicing the pipes. After the second incarnation of the Christmas cold I hadn't really touched the pipes for two or three weeks until last week. Not even for New Year's Eve. The lip, the reeds, and the fingers were in desperate shape and the RSCDS's Burns Supper was fast approaching. It was last Saturday, in fact, and you'll be delighted to know it came off quite well. Practicing instead of blogging was a wise decision. Now, then. What else have we got to talk about? These folks have come up with exactly that. Did everyone want to repel us when we were young? I don't recall that they did. . .but as I was even more self-centered then than now, perhaps they did I didn't notice. I hesitate to mention this. Southern Californians get no sympathy from the rest of the country, with possible exception of Floridians, when they complain about the cold. So I am not complaining. No, seriously; I'm not. I'm just mentioning that it has been extremely cold lately for this part of the world; the high 40°s is not the sort of day time temperature we are used to. Too cold to practice pipes in the park (and I have a gig coming up on Saturday which needs to be practiced for). On the other hand, I can get some use out of all those woolly sweaters Mary buys for me which usually spend 10 or 11 months in the chest. At one time the second Sunday after the Epiphany was held in honour of the Infant Jesus of Prague. Now that the "normative" rite doesn't have a "Second Sunday after the Epiphany" I'm not sure where He goes on the calendar. This seems as good a day as any, so let's keep it here. There is another somewhat shorter explanation of the devotion here. 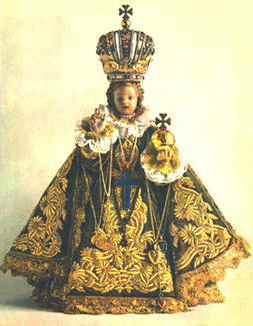 The Infant of Prague devotion has its origins in the Discalced Carmelite Order but has now spread so widely that many people are unaware of the connection. The devotion has great significance to monarchists and I have often seen it associated with the pro-life movement among Catholics. If you've ever wondered just what the Enron debacle was all about, try to get hold of the January 8, 2007 number of The New Yorker. Malcolm Gladwell has the closest thing to an explanation the economically and financially obtuse (such as your servant) are ever likely to get. It's really quite an interesting read. Enron actually did make all the relevant disclosures and anyone with the time to read the 114,000 pages of disclosure (single-spaced, tiny-typed, regulatory agency-inspired CPA disclosure prose, to be sure) would have known exactly what was going on. Gladwell does it in nine (9) pages and uses considerably racier prose. It doesn't appear to be on the web. But if your library has it, look on page 44. ADDENDUM: A kind reader who is better at researching the New Yorker site than I am located the article on line. It's here. "So. . .how did the new year's celebration go, John?" A very short celebration. Someone in the neighbourhood set off some fireworks. The dog next door made serious objection to this which woke me up. I said "Hmpy N' Yr, mmph." Mary said "Happy New Year to you, too, love." (How she can be so bright and articulate when awakened at any time of night is one of the wonders of the age. It's really quite remarkable.) Then we went back to sleep. And that was it. It just isn't worth the effort to stay awake with no Guy Lombardo broadcast. Magnificat posts a brief life of St Andrew here. This piece from the Star-Ledger concerns a Carmelite monastery in New Jersey with a surprisingly traditional horarium. A correspondent informs that they have the traditional Roman Rite Mass celebrated there 2 or 3 times per week and that the nuns are being taught Latin by the F.S.S.P. priest stationed at the nearby parish of Our Lady of Fatima. On this day the Carmelite Order honours one of its great theologians and bishops, St Peter Thomas. The old calendar revered him as bishop and martyr, as he died from wounds received from the Mahometans at the siege of Alexandria. The current breviary seems to have had second thoughts about the whole martyrdom thing and calls him an "apostle of church unity" just saying that he "died" and not mentioning his preaching the crusade against the saracen horde or the wound from the Turkish arrow. The picture is of St Peter Thomas. My notes on it have disappeared but if I recall correctly Zurbarán is the artist and it currently resides in one of the Boston museums. There is a short life of St Peter Thomas here.